Annual Cost of Attending Gettysburg College Nears $70,000 | The Gettysburgian. The Board of Trustees has approved an increase in the comprehensive fee to attend Gettysburg College for the 2019-20 academic year that falls just short of the $70,000 threshold. Tuition, room, and board at for the next academic year will be $69,850, a 3.5 percent increase from 2018-19’s total of $67,490. The comprehensive fee includes tuition, an unlimited meal plan, and the lowest rate for a room on campus. It does not include the cost of transportation, books, or other personal expenses. About two-thirds of college students receive need-based financial aid. In 2017-18 (the most recent year for which data is available), the average need-based award was $40,147, which represents 61.5 percent of that year’s comprehensive fee. On the whole, the college’s discount rate — the portion of tuition revenue the college devotes to financial aid through grants — reached 48 percent for the Class of 2021 such that, on average, the college collected $33,909 of that year’s $65,210 comprehensive fee. In a March 2017 interview with The Gettysburgian, President Janet Morgan Riggs said that the college’s long-term goal is to move annual tuition increases in line with the consumer price index (CPI) and that “we’re starting to get there,” but this marks the sixth consecutive year of a 3.5 percent increase. 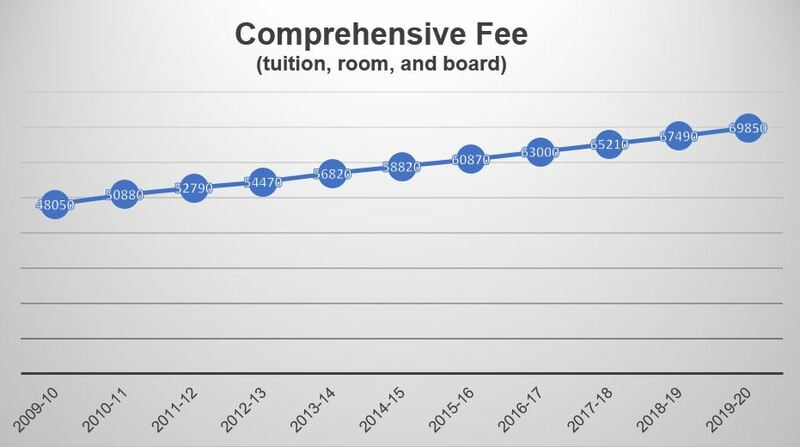 Since the 2010-11 academic year, the annual increase has gradually declined to its current rate, but it has stayed at 3.5 percent since the 2014-15 academic year. The February 2019 Bureau of Labor Statistics report put the CPI, which measures the cost to households of a market basket of consumer goods and services, 1.5 percent higher than 12 months prior. Riggs is expected to go into more detail on the college’s current financial standing at her annual town hall meeting with employees Thursday.